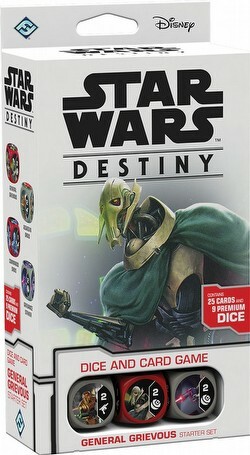 Enter the Star Wars galaxy with the Star Wars Destiny: Convergence General Grievous starter. The General Grievous Starter Set focuses on the Clone Wars from the perspective of General Grievous and two Commando Droids as they battle the Old Republic. It includes 24 cards and 9 dice. Convergence introduces a variety of new mechanics into Star Wars: Destiny, including the ability to hinder your opponent's characters with potent downgrades. Place a bounty on your enemies, lock onto them with a fleet of vehicles, or attack them mentally with potent Force abilities!